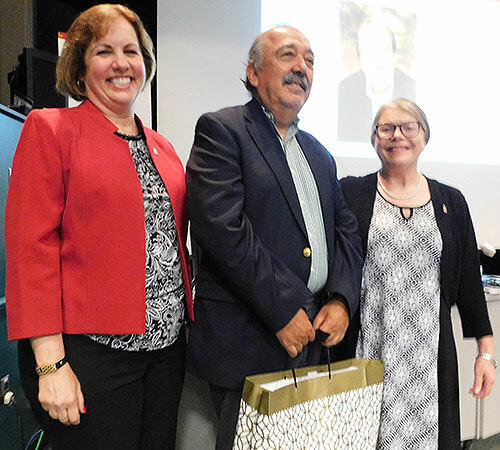 Dean Laurie Elish-Piper and Suzanne Degges-White, chair of the Department of Counseling, Adult and Higher Education, recognize and salute Jorge Jeria, who is retiring. Tuesday’s All-College meeting focused on department-level innovations and intentional growth strategies that support the Strategic Action Planning Framework. Dean Laurie Elish-Piper asked each department chair or faculty representative to present on one project or initiative that fuels the college’s values and priorities. The dean also shared estimated enrollment projections for the fall that make the bright ideas critical. New Department of Curriculum and Instruction Chair Sally Blake offered the Social Justice Summer Camp as her example. The camp, led by professors Joseph Flynn and James Cohen, will return by popular demand for a third year in 2019. Wei-Chen Hung, chair of the Department of Educational Technology, Research and Assessment, spoke of work to intentionally enhance the student experience. Beyond the User Experience Lab, Hung said, students also are benefitting from a faculty focus on learning analytics, new courses, certificates of undergraduate and graduate study and aspirations toward stackable degrees. Katy Jaekel, an assistant professor in the Department of Counseling, Adult and Higher Education, outlined the new Ed.D. in Community College Leadership. The three-year degree with dissertation seeks to fill “leadership vacuum” in community college pipelines. Fourteen courses either were re-invented or developed from the ground up to provide the necessary content to support this program. Meanwhile, a new model of delivery merged a one-week “Summer Intensive” meeting with fully online courses during the academic year. Chad McEvoy, chair of the Department of Kinesiology and Physical Education, and instructor Brandon Male, explained the launch of the Engage U.S. trip to the U.S. Olympic Training Center in Colorado Springs. The trip to Colorado was one of three new “Engage” experiences launched in the Department of Kinesiology and Physical Education, which also sent graduate students in Sport Management to Indianapolis through Engage U.S. and graduate students in Sport Management and Sport Psychology to Sri Lanka through Engage Global. Carolyn Pluim, chair of the Department of Leadership, Educational Psychology and Foundations, spoke about the Ed.S. (superintendent endorsement) program that will graduate its first cohort this year. The program is establishing a culture of excellence through relationship-building, communication and attending to the learning needs of students. 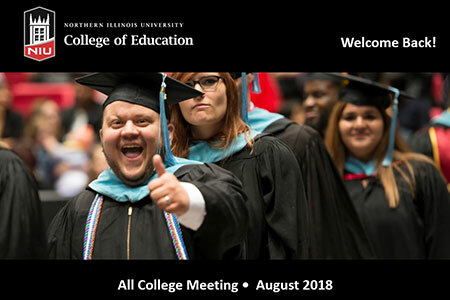 Toni Van Laarhoven, Presidential Teaching Professor in the Department of Special and Early Education, described the department’s one-credit “Exploring the Special Education Major” course that allows faculty to reach those students early in their academic careers at NIU. Check out some photos from the Ice Cream Social!